This enhanced package provides the physical Back Mechanic book (shipped to your address) plus the videos (1 year access to streamed videos) demonstrating the concepts, the assessments, the movements and the exercises contained in Back Mechanic. Some readers of Back Mechanic have asked for videos to bring the book to life. Over 100 minutes are provided to guide you on eliminating the disability of your back pain. When you receive your Back Mechanic Book in the mail, there will be an instruction sheet and ACCESS CODE inside that you will need for the Back Mechanic Video Series. NOTE: With the Vimeo ACCESS CODE that is provided on the instruction sheet, some codes have characters that can look similar like: Capital i’s & small L’s. If you have issues entering your code please email us your code and we will send you the code back to copy and paste. Back Mechanic guides you through a self-assessment of your pain triggers, then shows you how to avoid these roadblocks to recovery. This approach guarantees the most personally specific plan for you. Then effective exercises are coached in a step by step progressive guide. Many questions are answered that have eluded answers in the past. Spine expert, Prof. McGill used his 30 years of research findings and clinical investigations to create this evidence-based guide that has helped thousands reclaim their lives. To buy streaming format on Vimeo please visit: vimeo.com/ondemand/superstiffness. Expert strike force and speed, fast footwork and skilled movement are the features of proficient martial arts. But all of these features require an optimal blend of joint stability and mobility through the articulated body linkage. Balance, muscle pulsing for speed strength, core fitness for proximal stiffness and impact resilience are more elements that influence competency. This video describes some of these non-negotiable essential features of the resilient and skilled combat athlete, together with drills and exercises to enhance them. 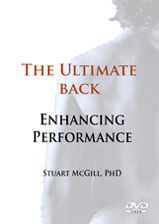 You can now buy the The Ultimate Back (DVD): Enhancing Performance in a streaming format on Vimeo. Please visit vimeo.com/ondemand/ultimateback to purchase. The objective when designing exercise is to train and achieve optimal performance with minimal risk of injury. 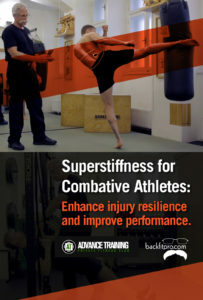 Synthesizing McGill’s approaches for injury avoidance with those proven to enhance performance resulted in this rich and idea-inspiring resource. This approach has been used by some top athletes in many sports together with those who are returning from back injury to surpass their previous bests. Some higher level assessments guide exercise decisions. This is followed with some corrective exercise, stability/mobility training, endurance training. Producing ultimate strength, power and speed requires skill. Both training skills and technique skills are developed resulting in higher performance. These techniques will assist in achieving “master” level skills. As with McGill’s other books and DVD, the approaches here are evidence-based. All of the video examples are real life, with real athletes. This is raw authentic footage where nothing is staged. This demonstrates how McGill assesses, cues and coaches performance techniques. 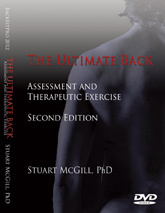 This is a companion DVD for the “Ultimate Back Fitness and Performance” book and was produced in 2010. DVD is recorded in world-wide format. You can now buy the Ultimate Back DVD in a streaming format on Vimeo. Please visit vimeo.com/ondemand/drstuassessment to purchase. This companion DVD illustrates the original techniques documented in Dr. McGill’s textbooks. Using real clinic settings and patients, McGill shows some assessment skills to determine specific intolerances and some therapeutic options for different people/approaches. This is followed with the subtle exercise techniques that enable the painful back to engage in the appropriate corrective exercise and then progress to stabilization/mobilization, and endurance training. 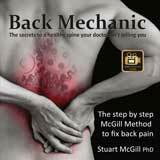 As with all of Dr. McGill’s material, it is evidence based and practiced by some of the top clinicians dealing with very failed backs, through to some of the best athletes around the world. New for the second edition is more explanation and demonstration of provocative testing technique together with mechanisms of pain and pain reduction. You can now buy the Golf DVD in a streaming format on Vimeo. 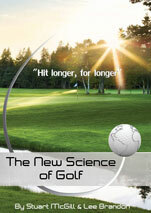 Please visit vimeo.com/ondemand/newscienceofgolf to purchase. World long drive champion Lee Brandon teamed up with Professor Stuart McGill to create this ground breaking DVD. Traditionally, scientific investigation has been on the golf swing motion. For the first time McGill brings some top golfers into the lab to measure their muscle activation patterns together with their body linkage forces. It turns out that how the golfer sequences muscle activation patterns determines how far the ball flies, as well as influencing the stress on the back, hips and knees. The great golfers are excellent muscle “pulsers”. Brandon uses this evidence in her lively coaching of the swing. Then McGill and Brandon take the viewer through a series of 50 new exercises to enhance the variables that have been shown to lengthen the distance of the golf ball while enhancing injury resilience. Run time 1 hour and 20 minutes. NOTE: If you use the Vimeo app to watch the On Demand Videos on your devices or TV, please visit the Vimeo app help page for additional instruction, tips & support. If you have issues locating your videos on the Vimeo app, you can always login to the vimeo.com website to watch them. Videos are available as physical DVD’s and also streaming videos which will eliminate the shipping costs. Our streaming videos are now available on Vimeo. Note to US customers: Orders are processed in CAN Dollars. Due to favourable exchange rates, US orders will be approximately 25% less than displayed rate. * For all large or bulk orders, please contact Kathryn at kathryn@backfitpro.com for shipping alternatives.